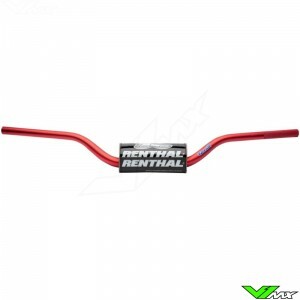 The Renthal Fatbar is the most popular aftermarket handlebar. Below you will find the different version available. The design of the handlebar is aimed at reducing weight whilst maintaining an extremely high strength. The braceless design allows for a comfortable level of flexibility. 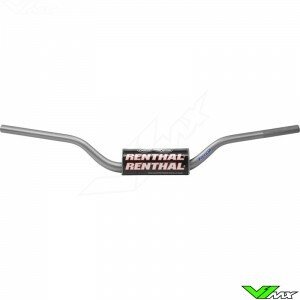 Renthal has exclusive rights to a specially developed 7010 T6 aluminium alloy, for the manufacturing of handlebars. Designed specifically as a handlebar aluminium the material helps limit vibration. Millions of tiny steel shots are blasted at high velocity at the bar, breaking the surface tension of the material and leaving a textured surface finish. The process increases the fatigue life and durability of the bar. The clutch side of all Fatbar handlebars are knurled. 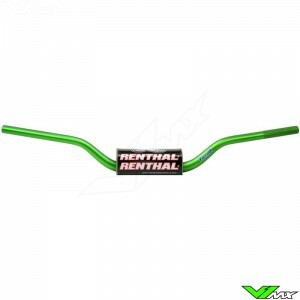 This gives a larger bonding area when applying grips to the handlebar. An anodised surface finish provides an integral coating preventing corrosion. The 15 step process is carefully carried on on each bar individually. The oversized clamping diameter gives means the handlebars are held in the bar mounts more securely. A position grid is laser marked onto the centre of the handlebar, a detailed setup grip ensures you can centralise the bar in the mounts and accurately set the angle in the mounts. 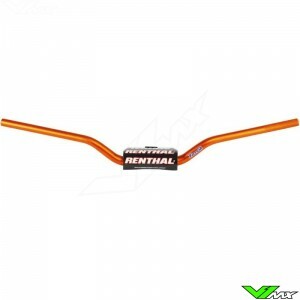 Every handlebar features the Renthal Fatbar pad, they help prevent injury and provide a smart look to your bike. Injection moulded to the highest quality, then wrapped in a durable pad cover.